Too intimidated to cook Chinese food at home but crave those punchy flavors? Not anymore. Put down that takeout kung pao chicken and get in the kitchen! 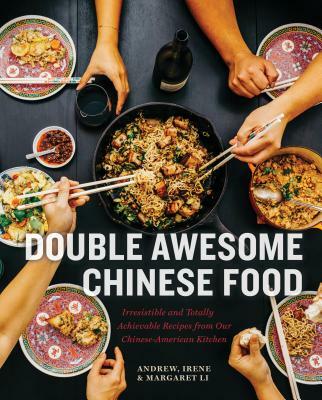 Full of irresistible recipes that marry traditional Asian ingredients with comforting American classics and seasonal ingredients, Double Awesome Chinese Food delivers the goods. The three fun-loving Chinese-American siblings behind the acclaimed restaurant Mei Mei take the fear factor out of cooking this complex cuisine, infusing it with creativity, playfulness, and ease. Take the Double Awesome: flaky scallion pancakes stuffed with two oozy eggs, sharp cheddar, and garlicky pesto; could there be anything better? Ridiculously delicious and unexpected dishes like Cranberry Sweet and Sour Stir-fried Pork and Red Curry Frito Pie will become new staples for your cooking lineup. Throw a hands-on dumpling-making party and let your friends decide whether to serve them chewy and pan-seared or crackly and deep-fried. Packed with pro-cooking tips, sauces to amp up any meal, sustainable sourcing advice, and over 100 delicious recipes, this book is your ticket to making the Chinese food of your dreams any night of the week. Margaret, Irene, and Andrew Li are the sibling co-owners of a food truck and restaurant in Boston, Massachusetts. Their food truck, Mei Mei Street Kitchen, opened in 2012 and was soon awarded Boston's Best Meals on Wheels by Boston Magazine. Their brick-and-mortar restaurant opened in late 2013 and was named Eater Boston's Restaurant of the Year. Margaret (aka Mei) currently lives in Atlanta, Georgia, with her husband and daughter and an ever-growing collection of cookbooks and board games. Irene is a four-time James Beard Rising Star Chef semi-finalist who loves rescue dogs and hip-hop dance videos. She lives in Boston with her husband. Andrew enjoys grilling, binge reading science fiction novels, and visiting every bouncy house in Greater Boston with his son, Jackson.